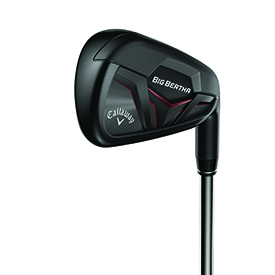 As the name Big Bertha implies, Callaway’s easy-to-hit-irons pack a punch. The company has launched a new iteration of the popular line with a new technology called Suspended Energy Core. Callaway has also unveiled a new Big Bertha hybrid – the first hybrid to combine Jailbreak technology with adjustability. The latest line builds on the 360 Face Cup technology that debuted in 2014. The new Suspended Energy Core technology improves the iron in three ways: in sound and feel, in consistent distance and launchability. The construction of the new Callaway irons is unique. A Metal Injection Molded (MIM’d) Tungsten Floating Weight within Callaway’s proprietary urethane microsphere material allows the center of gravity to be positioned deeper using a 3-piece iron construction. The technology enhancement means Callaway has created a higher launch while still allowing for a thinner, faster face cup construction. A thin face cup allows for increased clubhead speeds that promote longer distance. A stock set of the new Big Bertha irons includes a 4-iron through an “A” wedge. Steel and graphite shafts are available, and will retail for $1,200 and $1,300, respectively. Big Bertha hybrids have traditionally been known for producing high ball speeds and long distance. Callaway’s newest hybrid combines two features in a groundbreaking way: Jailbreak ball speeds and adjustability for easy launch. Callaway’s Jailbreak technology incorporates two internal bars that stiffen the body, placing more impact load on the face to promote fast ball speed and long distance. Combining that with adjustability meant creating a new hosel system that’s shorter and lighter than before. This new hybrid features a progressive head shape that’s both forgiving and appealing, and packed with high MOI technology. The ultra-thin, Carpenter 455 steel face is still extremely fast. Combine that with Callaway’s Hyper Speed Face Cup and a player will feel a fast speed across the face and experience long distance on center hits and even off-center hits. 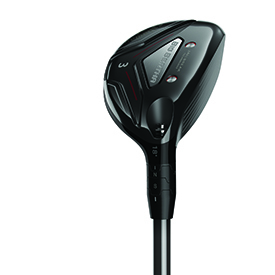 Callaway’s latest hybrid is available in a 3, 4, 5, 6, 7 or 8, and will retail for $269.99.